For some reason the “official” weekly photo challenge was not meant to be this week. Where’s my Backpack has stepped in to host this week and the challenge is Reflections. In the photo below you will see the reflection of the grass in the water. And if you look closely you will notice something else in the water. Let’s just say I wasn’t tempted to get out of the boat for a swim. This river is the Zambezi River in Zambia. I hope all is well with the normal host and thanks to Where’s my Backpack. This entry was posted in Weekly Photo Challenge and tagged 50 Year Project, Africa, Life, Nature, Photography, Photos, Postaday, Reflections, Travel, Travel Blog, Travel Journal, Travel Photos, Vacations, Weekly Photo Challenge, Zambezi, Zambia. Bookmark the permalink. I can only imagine…I enjoyed meeting you and other bloggers so your hard work is much appreciated on my end. Hummm–that’s not a floating piece of wood, then, is it? It made for an extra-exciting boat ride, I’ll bet! And by the way–no sooner did I publish my “reflections” post, than the Daily Post did publish its new weekly challenge. Go figure! I did see that the new challenge was posted…oh well. This was a fun one to participate in. Now I will see if I have any blue to put up. Keep all hands and feet inside the boat! Nice capture! They make that very clear once you get inside…and after seeing this, they didn’t have to tell me twice. Weekly photo challenge came up last night. It is blue have a look . Good you did something else I’ll have a look if I can find a reflection for today. It was fun to join in on the challenge and I hope you can find one. What a literal answer to the challenge! Excellent! Thanks Nia…don’t get out of the boat. I love taking picture of the gators in our ponds. It looks just sinister enough to make you want to stay far away! This is a crocodile, right? Being it’s in Africa… they don’t have gators. 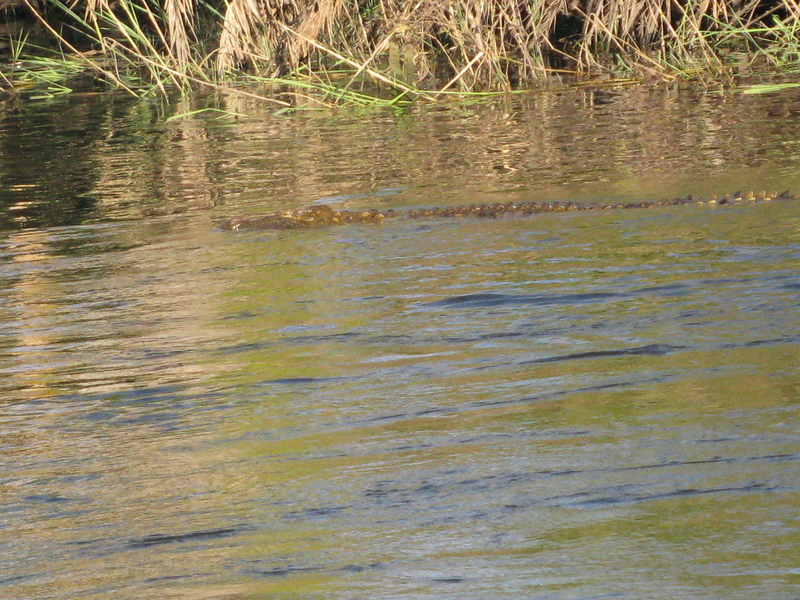 Yep it is a croc…I haven’t seen an alligator in the wild. I would love to, but from a safe distance. Very safe. Ohh a croc… I saw a few alligators on my trip to Orlando recently. That’s pretty cool…I haven’t seen gators, except in the zoo. I know…they aren’t kidding when they say keep your hands inside the boat. Yes it was exciting and I was thankful to be in a boat and not canoe. I’ve been enjoying seeing the world through your eyes as well. That’s cool! I’ll check it out later today or tomorrow and put a photo up. Thanks for letting me know!!!! I’m sure I have some summer photos I can dig up. Thanks for hosting again!